How does the ritual, regardless of personal faith or intention, affect our behavior? Deeply, experts say. I’m doing all that (which really doesn’t feel at all like enough) and then something I don't quite understand: I'm praying. As an agnostic who does not identify with any organized religion, my version of prayer isn't rooted in any tradition or theology. It's not a regular practice, nor one with set rules or goals. Sometimes I take the pantheistic approach of praying to the universe, focusing on sending healing thoughts out to the world, particularly others who are suffering. Sometimes I'll just visualize a ball of light in my head — a collective conscious benevolence — and aim to contribute positive energy to it. Sometimes I pray to my twin brother, Phillip, who died when we were nine years old. Prayer and meditation are highly effective in lowering our reactivity to traumatic and negative events. Lately I've been wondering just what the science is behind the act of prayer and meditation. What parts of our brains are activated or deactivated? How might such a ritual, regardless of personal faith or intention, affect our behavior? To learn more, I talked to several doctors including Dr. David Spiegel, associate chair of psychiatry and behavioral sciences and medical director of the center for integrative medicine at Stanford University School of Medicine, who discussed what the brain looks like on prayer. "Praying involves the deeper parts of the brain: the medial prefrontal cortex and the posterior cingulate cortex — the mid-front and back portions," says Dr. Spiegel, adding that this can be seen through magnetic image resonance (MRI), which render detailed anatomical pictures. "These parts of the brain are involved in self-reflection and self-soothing." While the reflective regions of the brain are activated, parts of the brain associated with taking action are inactivated. Spiegel notes that while these reflective regions of the brain are activated, parts of the brain associated with taking action are inactivated. It’s an interesting correlation that Spiegel says could play a role in why prayer helps people struggling with addictive urges. In one recent study conducted by NYU Langone Medical Center, members of Alcoholics Anonymous were placed in an MRI scanner and then shown drinking-related images to stimulate cravings (it worked, which sounds pretty cruel). But the cravings were soon after reduced when the participants — you guessed it — prayed. The MRI data showed changes in parts of the prefrontal cortex, which is responsible for the control of emotion and "the semantic reappraisal of emotion," the study cited. The link between deep reflection and a decrease in action can be a useful one while dealing with a trauma or other negative situation. It’s pretty simple: When we’re praying, we can’t be lashing out or kicking walls in. In other words, we can’t react. This isn’t to say one should bottle up their anger or sorrow and lock it up in a prayer, but for the sheer purpose of self-care, prayer and meditation can be useful when we’re barely able to cope. "Prayer and meditation are highly effective in lowering our reactivity to traumatic and negative events," says Dr. Paul Hokemeyer, a marriage, family and addictions therapist. "They are powerful because they focus our thoughts on something outside ourselves. During times of stress, our limbic system, more commonly known as our central nervous system, becomes hyper-activated, which does two things: it thrusts us in to survival mode where we freeze, fight or flee the situation, [such that] we move away from the present state of being into a future state. This also shuts down our executive functioning [and] prevents us from thinking clearly. This is why when we’re stressed out we can make poor decisions and act in self-destructive ways." When we sit down and engage in prayer or meditation, we are able to shift away from this frightened and stressed survival mode into "an intentional state," says Dr. Hokemeyer, and ultimately “reengage our prefrontal cortex, the part of the brain that rules our executive functioning and enables us to make intelligent mindful decisions." There’s also research backing the idea that meditation and prayer can trigger the release of feel-good chemicals in the brain. Dr. Loretta G. Breuning, founder of the Inner Mammal Institute and the author of "The Science of Positivity" and "Habits of a Happy Brain,” explains that when we pray, we can activate neural pathways we developed when young to release hormones such as oxytocin. Praying is saying: I am really hurting about X. I am really hoping for Y. I am looking for support from Z. And these meditative acts may be a way of being real with yourself — of locating where you are right now, what you’re feeling and identifying your needs. 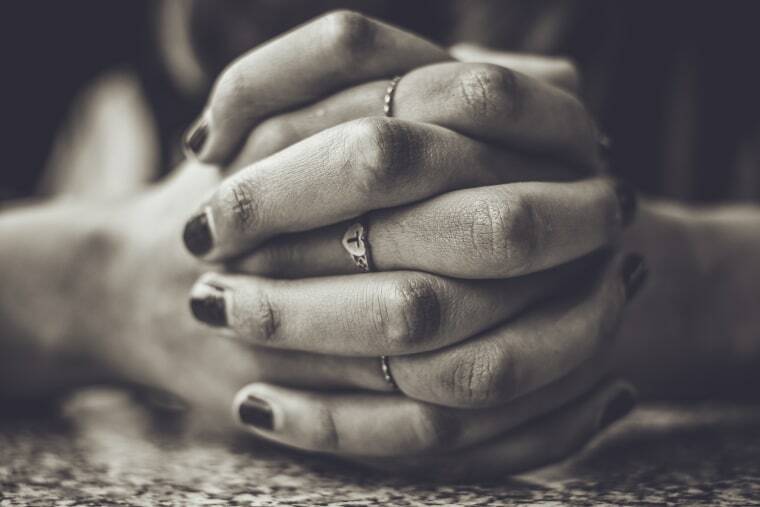 “[Praying in part] is saying to myself: I am really hurting about X. I am really hoping for Y. I am looking for support from Z,” says Breuning, adding that as a repeated practice, prayer can serve as a useful habit for times when we’re overwhelmed or struggling to figure out a solution. While there’s certainly a sound argument to be made for the psychological benefits of prayer and meditation, one discussion that comes up often (especially among those who are agnostic or atheist), is around what prayer can actually do in the world. How can we use it to not only center ourselves and self-soothe, but to take a positive action? The key, Dr. Hokemeyer finds, is largely one of balance.